Inscribed with Chenrezig’s holy mantra, this miniature prayer wheel is a simple and powerful addition to any daily practice, granting abundant blessings, protection and tremendous merits. 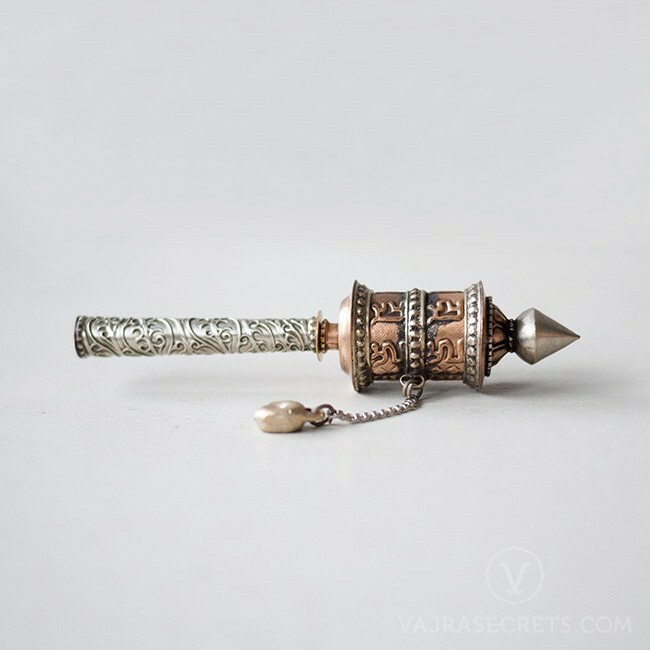 Take this cute, portable prayer wheel with you wherever you go to quickly harmonize the environment, increase compassion, encourage a peaceful state of mind, and assist you on your journey to Enlightenment. 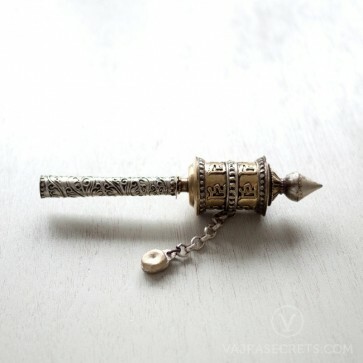 Inscribed with Chenrezig’s holy mantra, this miniature prayer wheel is a compact and powerful merit field, offering a simple and powerful method to accumulate vast merits, purify obstacles and develop compassion and wisdom. The prayer wheel consists of a cylindrical metal body filled with thousands of mantras, mounted on a wooden handle. The cylinder, along with the mantra scrolls it contains, can be kept turning clockwise with a slight rotation of the wrist. Turning the wheel clockwise activates the prayer wheel, generating tremendous merits and distributing exponential blessings and positive wishes for all beings. It is suggested that one recites the six-syllable mantra – OM MANI PEME HUM – while spinning the prayer wheel. According to ancient Buddhist texts, the prayer wheel was invented by Nagarjuna, an eminent Indian scholar who is well known as the founder of the most profound Middle Way school of Buddhist philosophy. The prayer wheel lineage was then brought to Tibet by the renowned Indian Buddhist teacher Padmasambhava (Guru Rinpoche) and later practiced by the great tantric Buddhist masters Tilopa and Naropa, who passed it on to their disciples and then through a continuous lineage of enlightened teachers until today.